12' 8' long 3" thick 20" wide hard maple butcher block shuffleboard playing surface. This play field is made in our own state of the art radio frequency press. We use locally harvested hard maple to glue up all our shuffleboard butcher block tops. If you are building your own shuffleboard table or looking for just the replacement play-field butcher block top. Includes set of climate adjusters installed and shipped in crate with free shipping. 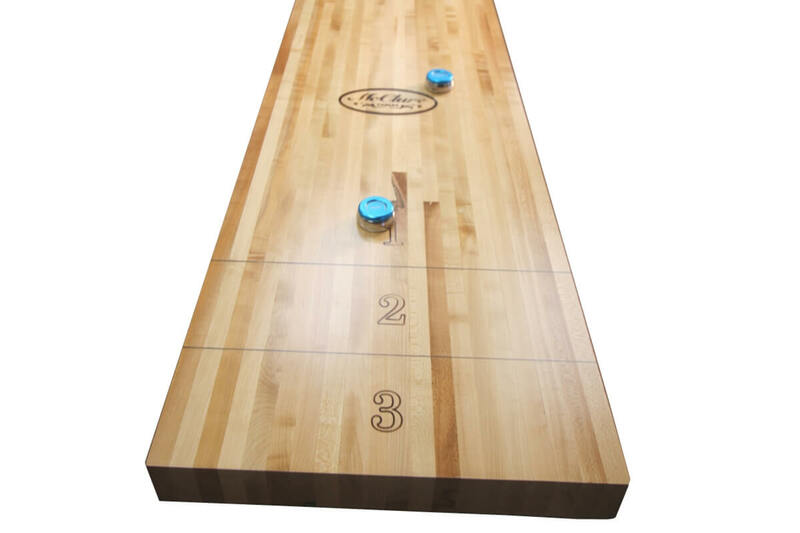 Shuffleboard top is made with hard maple and available with the traditional finish or if you want a custom logo or graphics we offer the poured polymer boards with the price including the up charge for standard graphics.